The Flash was the very first current generation #DCTV show to feature a crossover. Barry Allen made his debut appearance on Arrow a year before his own eponymous show launched. In The Flash’s pilot episode, Oliver Queen returned the favor as Stephen Amell made a guest appearance. Later, Barry dropped by Supergirl, which at the time was airing on a different network, before Kara eventually made her way to The CW and, alongside the crew of the Waverider, joined our now yearly four-show crossovers like “Invasion” and “Crisis on Earth-X.” But it all began with The Flash and Arrow, so it’s nice to see elements of those two shows reunite like they did tonight. In tonight’s episode, “Think Fast,” we were graced by a cameo from one of my all-time favorite characters: John Diggle! Fun fact: This character is original to Arrow, where he initially debuted as the bodyguard and chauffer to a newly returned Oliver Queen. Second fun fact: Like Harley Quinn (who debuted on Batman: The Animated Series before being integrated into the comic book continuity), John Diggle has been brought into the Green Arrow comic series as well. He was first brought on during the New 52 and remains an integral part of the current Green Arrow storyline. If you are interested in peeping out some comic book Diggle, I’d recommend checking out GREEN ARROW VOL. 1: THE DEATH AND LIFE OF OLIVER QUEEN. Third fun fact: John Diggle was given his surname in honor of acclaimed comic book writer Andy Diggle, who penned the completely awesome GREEN ARROW: YEAR ONE comic book. The book is drawn by Jock and was definitely a powerful influence on the first season of Arrow. He is also a character who is responsible for my all-time favorite joke in the entire #DCTV Universe: throwing up after being snatched up unawares at super-speed thanks to the Flash. The joke is so pervasive that now even Caitlin, Cisco and Iris know to expect an upset stomach when Barry arrives with A.R.G.U.S.’s best son. 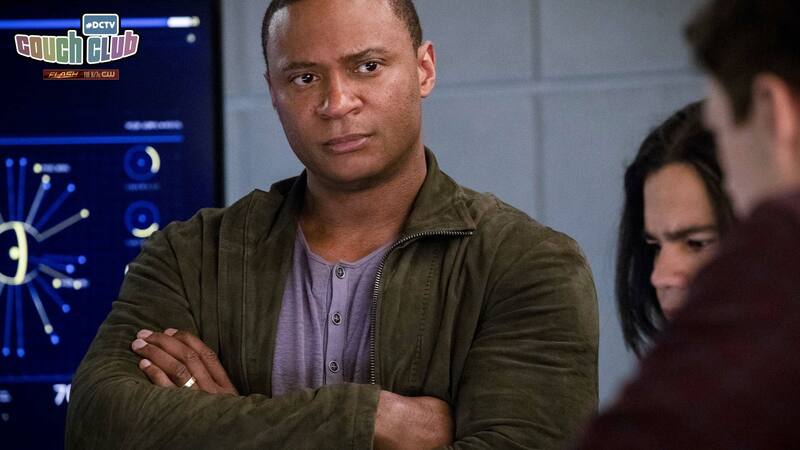 Despite my love of the laughs, Diggle does lend some real seriousness to “Think Fast” and offsets the silliness of Joe and Cecile’s story this episode. Since Harry is also less somber now that he’s losing his intelligence, I appreciated what he brought to Team Flash. As this is the penultimate episode of season four, I expect everyone to be operating under the highest of stakes and approaching the threat the Thinker presents with the greatest gravitas. If I want to be picky, I’ll admit that I wish Diggle would have stuck around for more than one scene, but I’ll take what I can get! There’s a part of me that is hoping he might show up for the season finale episode of The Flash next week with the full arsenal of A.R.G.U.S. at his back in an assault against Clifford DeVoe. Let me know how likely you think this might be down in the comments section! Speaking of which, let’s circle back around to DeVoe. Our very first, very powerful non-speedster season-long villain has spent a good chunk of time in The Flash this season hopping bodies. If you’re like me and enjoy focusing on and breaking down each actor’s performance, then we’ve had many excellent opportunities this year thanks to all of that body hopping! There have been so many different actors playing Clifford DeVoe across the latter half of the season and making choices based off what Neil Sandilands laid down leading up to the trial of Barry Allen. Personally, I think David Ramsey gave a wonderful show as the Thinker as Agent John Diggle in the opening scene of “Think Fast.” He walked a fine balance, so I didn’t realize it was DeVoe and not Diggle until right before the awesome camera move to reveal this very fact. Bringing Diggle onto The Flash for the penultimate episode served a couple purposes, in spite of its brevity. He stepped into the shoes of Harry, who has been uniquely suffering. He also helps us, the audience, to understand just how serious the crackdown on DeVoe has become in the eyes of Team Flash. Finally, he offers a subtle reminder that the events that play out in this corner of the universe do have the potential for wider ramifications. More cameos, please! Who do you want to see popping up for a single episode of The Flash next? I want to read everyone’s answers down in the comments.